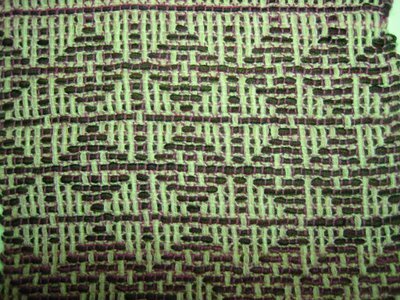 Liz (Calnan – my weaving teacher) explained that diversified plain weave is a development of plain weave. Thick and thin yarns are used in sets of three – thin, thick, thin – in both warp and weft. You need 4 yarns: a thick dark and a thin dark, a thick light and a thin light. 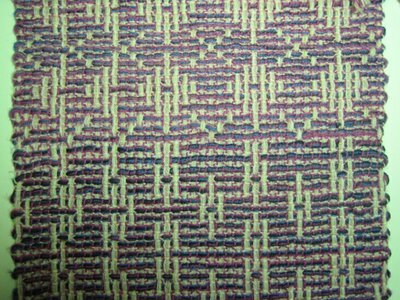 The thin threads provide a stable plain weave ground. The thick threads in warp and weft dominate visually. They can appear to have long floats, but in fact they are held down by the thin threads. You help the visual effect with yarn choice. For example in the warp you could use light thick and dark thin. In the weft choose a dark thick and a light thin. 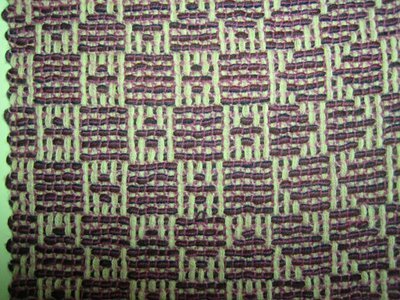 When the thick dark weft goes under the thin dark warp the warp is hardly visible. The weft is safely held down in the cloth without interrupting the visual design. When the thick light warp goes under the thin light weft – weft not visible. You can get some very graphic designs without having to worry about float length. An example. Say I want to weave circles using 6 shafts. I develop a design – it looks OK, but I have floats over 5 threads. If I’m using fine threads that might be OK, depending on the end use of the fabric. If I want to use thick threads for a nice warm scarf the long floats can catch and be impractical. 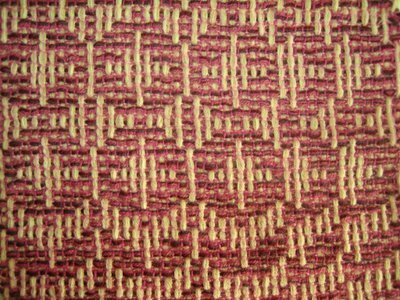 I can have my pattern and stability by adding extra thin threads and using diversified plain weave. From a distance the circle design is still apparent. However the maximum float is now over three threads – one thick and two thin – so the final cloth is much more satisfactory from a structure and wear point of view. 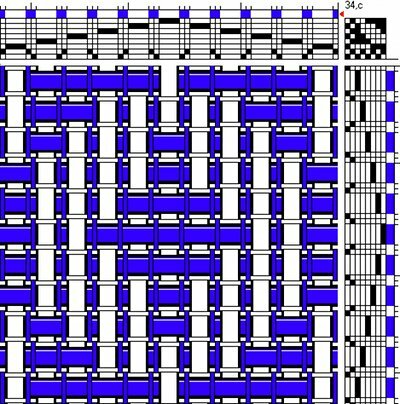 The top right 6 x 6 grid of the tie up looks the same. I’ve used 2 extra shafts to carry thin, dark warp threads. I have groups of threads, threaded on shafts 232 (that is, thin on shaft 2, thick on shaft 3, thin on shaft 2); 141; 252; 161; 272; 181. In the weft I used 2 shuttles – a thin light thread and a thick dark one – in groups of three picks: thin, thick, thin. Some extra work using the two shuttles, and some extra chunkiness in the design. On the plus side, as long as I maintain the rhythm with the thin threads, I can have the visuals of floats of any length, while the actual floats are totally consistent 3 threads. Here’s that design on the sampler/scarf. You can see on the right of the photo that I had a couple of straight runs before the pointed threading, and on the bottom I lifted in a straight run. I didn’t have appropriate thick and thin yarns in my small (developing!) stash, so I decided to treat it as an opportunity for colour experimentation. I used bendigo mills 2 ply classic wool throughout. “Thin” equals one thread (in the warp “sweetpea” if you know bendigo yarns – a rich dark pink). “Thick” was 4 threads bundled together (in the warp 1 each of “almond”, “raffia”, “rosebud” and “peony” – light neutrals and pinks). The weft was also all bendigo 2 ply, but lots of combinations of darks bundled, and different lights at different times. The pattern is the same on the back, but the negative image (ie lights and darks swapped). I wanted a nice soft draping scarf, so sett at 18 epi (where “end” is the individual threads of 2 ply – effectively 3 sets of “thin, thick, thin” per inch). Liz’s notes suggest denting a full three thread sequence together if possible. I had a 12 dent reed on the table loom, so I used 4 dents per set – a thin on its own, 2 together (half of the “thick”), 2 together (half of the “thick”), a thin on its own. I think the result is exactly right – very soft and cushiony. Although you have to fiddle with the 2 shafts, working with the thicker yarns meant the weaving was very quick. It’s effectively plain weave so you don’t have to do anything special for the selvedges, although the thicker yarn did give a rather nice scalloped effect. After finishing I had shrinkage of 7 % in length and 11% in width. Another nice thing about diversified plain weave is that every extra shaft you have gives you a bigger grid to design in. Shafts 1 and 2 look after the thin plain weave. If you have 8 shafts, you have a 6 x 6 design area. 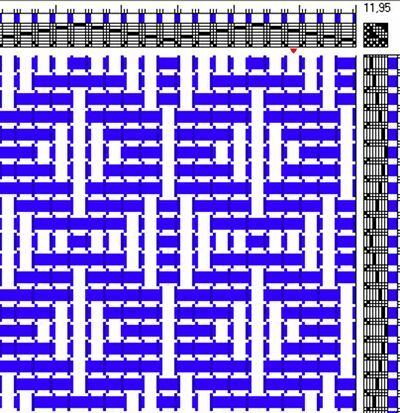 My floor loom has 24 shafts, so I could have a 22 x 22 grid design area. 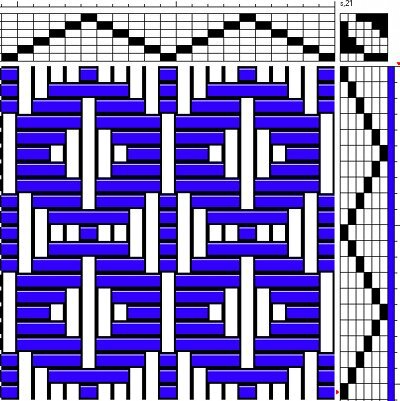 Altogether a fast and fun weave, and something I’d like to explore more some time. On this section the "dark" weft bundle was too great a contrast to the "dark" thin warp - though I still like it! Sorry about the very ordinary photos – a combination of a borrowed camera I’m not familiar with since mine has died (sigh), plus fading afternoon light.